There are three things that are very clear now that Jimmy Fallon has hosted his first Tonight Show. Alas, one of them is not whether NBC’s gamble of bringing him to 11:30 will pay off in terms of ratings, or even if he’ll have the job for very long. But viewers of last night’s broadcast, whether or not they knew anything about Fallon and his tenure on Late Night, came away knowing for certain that he’s really is nice, he’s incredibly happy to be here and he has a lot of friends. That last one was highlighted by a parade of celebrities, from Robert De Niro (his first guest on Late Night) to Lindsay Lohan to Stephen Colbert, there to deliver Fallon a nice crisp c-note after he mentioned that his “buddy” who said Fallon would never host the Tonight Show now owed him $100. Colbert’s inclusion was important not just because he and Fallon are friends, but also because they are now direct rivals, timeslot-wise. Jimmy isn’t really into the idea of late-night wars (he even brought Joan Rivers back after a decades-long absence when Johnny Carson banned her for trying to start her own late-night show). Wars will only get in the way of having fun. Fallon started things off hitting all the right notes. He’s got a new opening directed by Spike Lee that highlights New York and a new set (there might be a little too much wood). But really what was so good, and so Jimmy about the whole thing, is that he walked out in his new set, on the first night of standing on a literally and figuratively bigger stage, and said “Hi, I’m Jimmy Fallon.” It’s a gesture that will not go unnoticed, not with Leno’s older audience that many are predicting will flee, nor with newcomers there for the hype. Fallon is an unpretentious guy, and he’s here to win you over, if you’ll let him. As Fallon has said in many interviews in the lead up to last night, he’s not really changing his Late Night formula. And after his introduction (and a ridiculously cute interaction with Fallon’s parents) he jumped right in, starting off with two segments he’s become known for, “Superlatives” and another spoof of “The Evolution of Dance.” This time the spoof was the Evolution of Hip Hop Dancing, with first guest Will Smith in tow and in matching overalls. If there was any way of definitely showing how different Fallon is from Leno, this video was the way. It’s a spoof of a YouTube video where the jokes rely on knowledge of Hip Hop (and also The Fresh Prince of Bel-Air). Welcome to the new generation of the Tonight Show. The rest of the show was pretty standard and a little safe, which tracks because Will Smith and U2 are very safe guests. U2 did get a fabulous concert on top of 30 Rock at sunset, with a backdrop of the New York skyline that almost looked photoshopped. I’m not a big Will Smith fan, so his segments were not necessarily my favorite, but the moment when U2, in their “spontaneous” performance of their Oscar-nominated “Endless Love,” called on the Roots to join in was pretty great, and a reminder of how important music is to the Fallon equation. All in all, the premier was as good as it could have been, but it was also very much a premier. 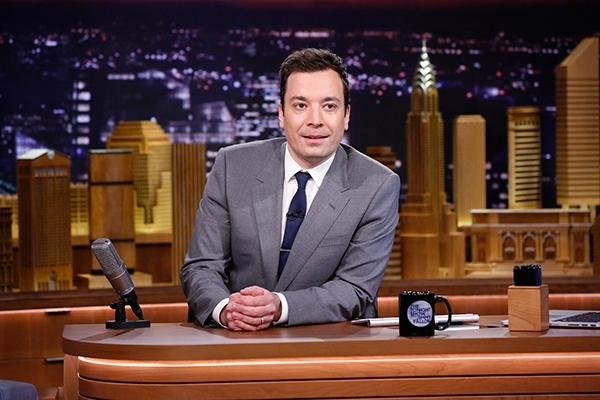 It was all about it being Fallon’s first time, and about the show being back in New York. It will really be months before we see what the show really is. But based on this preview, I’m definitely look forward to it.